My intention in getting a dog was not to bring about any major life changes or lessons but rather to find a trusted companion, someone who was happy to see me after a long, hard day at work. 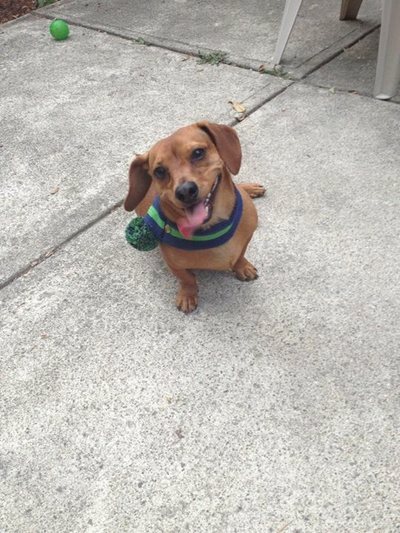 However, I certainly got more than I bargained for when I adopted Barney, a whole-hearted dachshund mix. Barney has taught me more than I ever imagined any dog ever could. Previous to Barney coming into my life, I had been searching for happiness outside of myself, through other people, material things and personal success. What I’ve come to find out, thanks to my four year old dachshund, is that I was looking in all the wrong places. 1.Take pleasure in the simple things: I would buy Barney toy after toy and he would continually go back to the old tennis ball I took from my parents’ house. That tennis ball is his favourite thing in the world. Whenever I take that ball out to play with him, he goes crazy. 2.Make less comparisons: Barney is a mutt so when we took him to his first dachshund meet up, he looked a little out of place. His nose was slightly shorter and he wasn’t as long as everyone else. While some of the other owners turned their noses up at him because he was a purebred, Barney didn’t seem to notice his differences and per usual, jumped straight into the action. 3.Don’t take things for granted: No matter how many times you throw the tennis ball to Barney or give him a scrap of chicken, he is equally as excited as the last time. And he is always excited to see you, no matter whether you’ve been away for a week or 10 minutes. 4.Develop a strong sense of self-worth: Our neighbour used to call Barney the “mayor” and my father-in-law has dubbed him “Lord Barney”. Barney has no problem with his self-esteem. He doesn’t care what anyone else thinks of him, he knows who he is and he thinks he is perfect just the way he is. 5.Accept your imperfections: Barney is almost always the smallest dog at the dog park but it never seems to bother him and it never, ever stops him. He always in the middle of the action and you know what, none of the other dogs seem to notice either. Barney has been the best therapist a girl could ask for. He has helped me to understand that in order to be happy, you have to be grateful for what we do have, enjoy the present without regretting the past or longing for the future and be accepting of our imperfect selves. Our furry friends certainly can teach us a thing or two. Love your article. That pic of Barney definitely shows what a cutie he is.